The band Wishbone Ash has been blazing its own trail ever since it formed in 1969. Wishbone Ash is one of the first bands to use twin lead guitars. Led by Andy Powell on guitar and vocals, the band continues to perform extensively. Wishbone Ash will perform Sept. 17 at the Arcada Theatre, 105 E. Main St., St. Charles, as part of its "Take It Back Tour." Also on the bill is the band Sweet. The show starts at 8 p.m. and tickets are available by going to www.arcadalive.com. I had the chance to talk to Powell about the band. Q - It looks like you guys are booked up until the end of March. Do you love being on the road and in front of fans? Well, we actually have a few dates in April as well, but those haven't been announced yet. It's just what I do. I am a traveling musician. We've had a 4 1/2 month break this summer, so I can't complain. It's quite a nice lifestyle, really. We tend to work in the winter and the spring and the fall, and take the summers off. Q - I know on this tour, you will be doing some older songs along with some new songs. You will be playing some songs from your last album, 2014's "Blue Horizon." What should people attending the show expect? With a band that's been together as long as we have, you have a vast catalog. So you have to be mindful of the fact that some people may not be aware of the current history. We don't mind playing the old classics. I certainly don't mind it. But there is also the gratification of playing more current material. At the end of the day, the goal is to produce a show that will make people walk out of the theater or club and say, "Wow, I just experienced a great show." That's the key thing. So we have the material to help us do that. It's not a problem. It just takes some time to figure it all out. Q - As far as your latest album, "Blue Horizon," in sitting down the make the album, what were your goals and do you think you accomplished them? Recording has gotten more technical and complicated. Our goals were to simplify the process as much as possible, and to write meaningful songs and accessible songs. It was very much song-based, but there were also serious guitar workouts on the album. Every song had to stand out. Q - So you're pretty happy with the album? I am very happy, yeah. I feel it turned out really well. It's still very true to the Wishbone Ash sound. You always have to tread carefully, because you want to give longtime fans what they expect, but you also have to gently lead them into new pastures. Q - Wishbone Ash was one of the first bands to use twin lead guitars. At the time, did you think you were doing something revolutionary? I think that we were very excited that we hit on a signature sound, you know. We kind of recognized that from the get-go. But we didn't recognize how much it would become identified with the band and how intrinsic it became to the band's sound. The other thing is, all bands in the early '70s really had to play their own kind of style. We came up with a really melodic kind of sound, but it was really powerful. I think that really excited people. Q - I know that you joined the band after answering an ad in "Melody Maker" seeking a lead guitarist. In the '60s and '70s, there was so much fresh music coming out, that they needed papers and magazines to report on the music. The "Melody Maker" was the most musician centric paper. I had answered an ad sent out by the rhythm section of the band. They really liked what I did, and I liked what they had to offer. They had proper management and they had direction. They had a goal. It was a very fortuitous audition. Q - Did you ever think you would be with the band 47 years later? No. I figured that if you had five years in a successful band, that would be really great. I had no idea that I would be touring the road still. You still hear these classic rock tracks being played on the radio, and some young bands referencing some of the music played during the late '60s and early '70s. I didn't think it would go on for almost 50 years. That is an incredible legacy. I think there was some great creativity in that era. Q - Of course, there has been a changing lineup in the band, but I found it interesting that your bassist, Bob Skeat, is a 19-year-old veteran of the band. 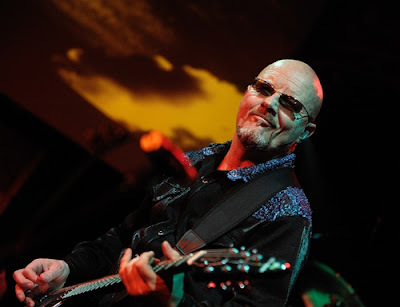 What do you think of the current lineup of Wishbone Ash? Well, it's actually been the most stable lineup. It's been a really solid lineup. The four of us get along well and travel together. We work well together. It's a mature lineup, and I think that's been good, both for the fans and for the band's music. I feel quite privileged that these guys have stuck with it, and enjoy the lifestyle. That's the key thing. Q - By next September, "Wishbone Ash: The Vintage Years" is expected to come out. Is that something you really wanted to get out to the public? The deluxe box set will be a 32 CD retrospective. It will include a table book with all kinds of artifacts and rare photographs. Actually, it's amazing. That really only will cover the first half of the band's long career. It's exciting that a lot of material has been saved and not released. And that's going to involve a lot of the original members and a lot of the original record labels and producers that were involved in the early part of the band's career. I know it's going to be handled really, really well. It's nice to encapsulate the first half of the band's career in that way. Q - Are you admiring the work of any current guitarists out there? I'm always listening to fresh takes on the electric guitar and the acoustic guitar. Certainly, I'm very aware of people who are pushing the boundaries a little bit. I like a lot of people in the Americana genre, people like Bill Frisell. He is kind of a jazz-folk American guitar player. I like him a lot. Obviously, Joe Bonamassa has done a great job with rock-blues, and promoting the whole vintage guitar thing, and doing a lot of tributes to the music of the late '60s in particular. He keeps that kind of muscular guitar sound approach in the public eye. Personally, I probably tend to listen to a few more acoustic-style players these days. Maybe that's my age, I don't know. I love the new Jeff Beck album. I think he still has a really interesting style, and is pulling in the younger audience that admires what he is doing. There's a great band from Brooklyn that I like called Lucius. I also like some of the production work of some of the younger bands. I'm always checking things out. Q - Of course, the music business has changed drastically since you first started. How are you keeping up with the changing music business? Speaking personally, I recognized the changes that were going down very quickly. And we were one of the first bands to sort of think on our feet from that older generation. I think a lot of them were slow to give up those luxuries of the business as it were, where you had dedicated A&R people and dedicated managers. The business has changed in as much as younger musicians have to self-manage and self-promote. They have to be a lot quicker on their feet. We were one of the first bands to get on the internet and have our own website. I realized how important social media was going to be right from the get-go. We use all technology that is available and in that way, we manage to move with change in the music business. You cannot make the income that you used to make from recordings anymore, you have to be out on the road. But that's easy for us, because we never stopped. We've always done 100, 150 dates a year. It's been a natural evolution for me. Q - So do you have any dream projects? I wouldn't mind doing a solo album at some point. We did an acoustic album as a band back in the day, and I have a hankering to mine that seam a little more. I have enjoyed playing traditional instruments a little bit more this summer. I was playing mandolin and I love folk instruments, so I wouldn't mind doing that in perhaps a side project. That's one thing I kind of dream about, if you wish. Other than that, we've actually put out a lot of material in the last couple of years, so we need to just allow that to just permeate for people to assimilate. I feel at the moment, we just need to get out there and promote and do what we can.